My boys are on fall break for two weeks, and we have BIG plans. Plans that include fort-building, pumpkin harvesting (from our back yard! ), cupcake making, leaf raking, park hopping, and nap taking (who am I kidding?). Blogging just doesn't fit in. Welcome to retro week! Each day, I'm posting some of my favorite pictures and posts from the last few years. Yesterday in preschool, the kids made a picture of 'Alphabet Soup' using letter-shaped pasta. 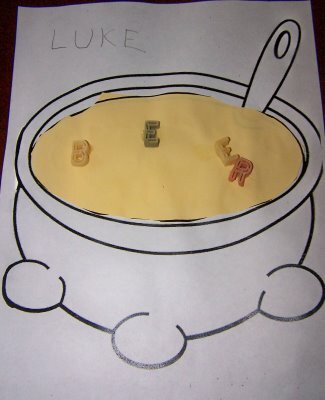 This is Luke's bowl of soup. I sense a parent/teacher conference heading straight for me.